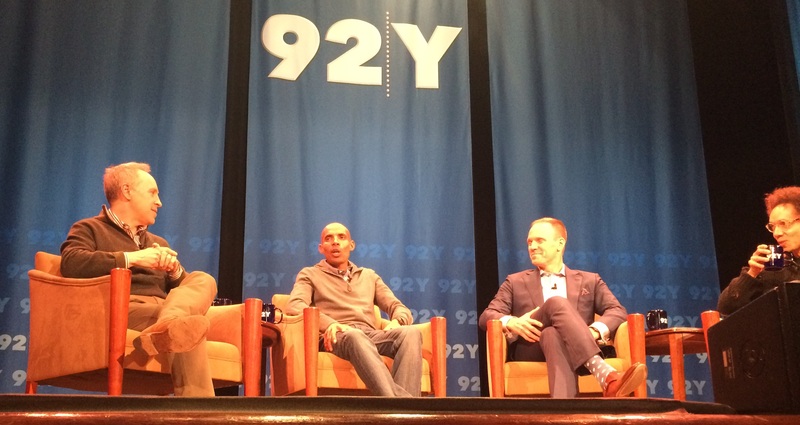 OMG, so last night a really good friend offered Juan and I tickets to go see Meb at the 92Y (a fantastic gym a few blocks from us that holds these sort of talks every day, with mega stars like Hillary Clinton or Neil Patrick Harris, same level, right? shut up, I love NPH SO MUCH!). Aaaaanyway, we got there early and we were the first in the premium tickets line. Met my friend Carolina there and we all set up in the first row. YEY, score! So, here’s a few notes my phone took, because, MEB. –Because of the war, they moved from Eritrea to Italy when he was ten, there’s no running there, so he played soccer: In Italy, they called me Pele. –Talking about goals and how he’d been able to stay competitive for s long: I am really looking forward to May 6 when I turn 40 and no one is looking for me to do much! No more pressure! — He talked about injuries a lot, how anything bad that happened was there to make you work on that part of your body/training so you could come back stronger: Experience is the best teacher there is. –When asked what was his favorite marathon: New York City. This man is so so inspiring… he talked a lot about the hard work it took for him to get over every single injury, hours and hours of PT, you know, things we might not have the patience with… all over OVERCOMING. 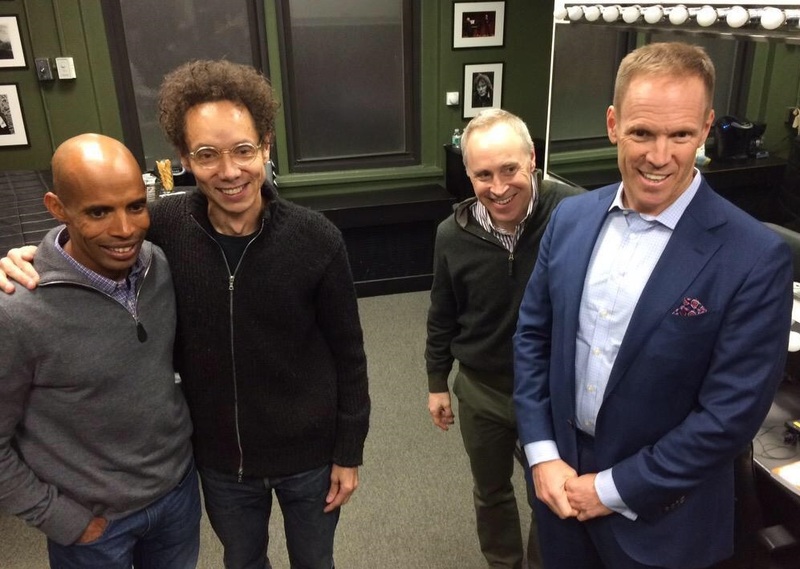 And, emmm, Malcolm Gladwell was there… I had no idea who he was (shhh don’t tell him) though his name sounded really really familiar. I have to say, now, I am OBSESSED with him. He’s super funny. Funny and Smart and funny AND smart…! and a Runner obviously, so I’ll have to go check out his books ASAP. or in YouTube or whatever, anywhere. I might start stalking him. He is amazing. I might buy him a sweater. The host/moderator was great too Jacob Weisberg, probably the best job I’ve ever seen anyone do at something like this, no lulls, no awkward moments, all fun and friends. It was a great night!! PLUS, I was in bed by 10! Get their books people, they all seem worth it!!! OMG Meb, I love him so much! Always smart and the epitome of class. What he has done and continues to do for this sport is beyond words. He proves that good training plus strategy in the race can secure a win even if you aren’t on paper the fastest guy out there. Class!!! Exactly!!!! He talked so much about the extra work he does: icing, stretching, core, plyos, massage, PT, self therapy… stuff that would put us to sleep or frustrate us, but all that EXTRA work he does… makes a difference. He’s willing to go all in, I love him. So awesome! Loved the part about Italy: so cliche’, but so true. We do have great runners, but running is not very popular in the youth community. It’s usually soccer for guys, volleyball for girls. That’s also what you do in PE. And I HATE volleyball. OMG same thing in Argentina!!!! I used to compete in Valleyball and HATED it… All i cared about was my nails not getting broken, hahahahaha. Iknow one Italian runner: Baldini!